To drive safely, it’s crucial that you have a clean windscreen; dust, mud, insect residue and road film can significantly reduce driver visibility. Unsurprisingly, this can increase the risk of accidents. However, plain water will not remove the grease and grime that builds up on a vehicle’s windscreen; this is why you need to ensure that your Toyota has enough windscreen washer fluid. Toyota windscreen washer fluid is designed to cut through grease and dirt, dissolving and washing it away in seconds. It also acts as an anti-freeze, protecting against freezing to -50 °C. Enhancing wiper blade action, Toyota windscreen washer fluid is gentle on paintwork, rubber, plastic and metal. Choose the washer fluid that’s appropriate for your local weather conditions. Before topping up, park your Toyota on a flat surface. You also need to ensure that the engine is sufficiently cooled. Raise the hood; make sure it is securely fixed. Locate the reservoir cap, which can be identified by a windscreen and spray icon. Open the cap. If you have a newer vehicle, you can check the fluid level by holding your finger on the depression hole. You should also check for cracks or leaks. Once checks are done, set the cap down. Pour in the washer fluid, filling it to the top. Close the reservoir cap and let down the hood of your vehicle. 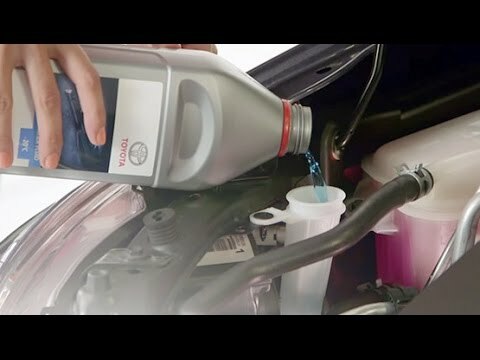 If you’re unsure about topping up your windscreen washer fluid, visit your local Toyota repairer, who will be happy to offer expert assistance.